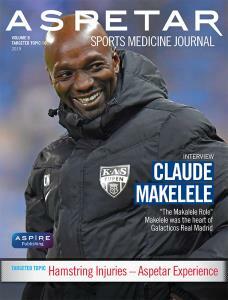 What is the aim of sports medicine in football? Some could answer: “To maintain the health of the players.” No, this is not the aim; the final aim is to win. Each professional club aims to win, therefore football doctors work daily to help their employer (the club) to win, within the ethical limits of their profession, of course. One of the ways to reach this objective is to reduce injuries as it has been demonstrated that their incidence affects the final results1. The way to reduce injury incidence is called prevention. Conducting an injury surveillance study is the fundamental first step in order to implement an adequate programme of prevention. What are the most common injuries? When do they happen? What is the mechanism of these injuries? These are questions of vital importance in order to … win! Epidemiological surveys on football injuries have been implemented in Europe since the end of the 1970s, particularly in the northern countries. At that time these researches were focusing on amateur or semi-professional footballers. They described some typical injuries for footballers and the possibility of reducing their incidence. In the last 3 decades, professionalism in football has increased and injury surveys have been performed at all levels of football: amateur, semi-professional, professional and elite. Moreover, they have also been performed at youth level and in women’s football and implemented in many countries. The highest expression of club level football in the world is represented by the UEFA Champions League. Since 2001, UEFA has implemented an injury survey among Champions League clubs, with the aim of reducing injuries which, at this level, have a high economic impact. The group study for this project is led by Prof Jan Ekstrand, one of the pioneers of football injury epidemiology. The UEFA Champions League (UCL) Injury Study involves 25 top level European football clubs from 10 different countries such as Barcelona, Chelsea, Bayern Munich and Juventus. Each day, injury data together with information on the football activity exposure of each player are collected by the medical staff of these clubs and sent to the group study. Feedback on the club’s injury profile is sent periodically by the study group to the club in order to help them to implement specific prevention programmes. To date, the results of this survey have been extensively published in the scientific literature2,3 and have helped to identify the most common injuries at that level of football as well as their characteristics. Similar to UEFA, FIFA is also conducting surveys in all its main competitions such as World Cups and international tournaments. Many national associations such as those in Norway, Sweden and Denmark have implemented prospective epidemiological studies in football and numerous clubs have developed independent injury registries for their teams. Injury epidemiology in Asian football is less established than its European counterparts. Some surveys on injuries at international competitions have only been implemented in the last decade. Prospective studies are even more recent. The most present in the literature are data from Qatar where an injury collection for the first division teams (Qatar Stars League) has been implemented since 2007. Since it has been shown that there are regional differences in injury epidemiology, collections from different part of the world are indispensable in order to tailor specific programmes of prevention. Findings in the Middle East have shown that injury incidence and patterns are similar to Europe, however there is an increased incidence of overuse thigh injury, particularly during matches4. Further research should investigate if this is due to players’ intrinsic factors or to extrinsic factors such as environmental conditions e.g. heat and humidity. The potential injury extrinsic risk factors in the Middle East warrant further investigation, especially considering the recent assignation of the FIFA World Cup 2022 to Qatar. An interesting finding in Qatari football has been the relationship between injury incidence and the final result of the team. Often, for coaches and professional league players, it is relevant to determine how injuries can affect team success. Research performed in the Qatar Stars League has shown a strong correlation between lower injury incidence rate and superior team success. These results may confirm the aforementioned hypothesis that an effective medical staff may contribute to team success by implementing evidence-based injury prevention strategies. However, this intriguing issue is difficult to study in a real world setting and thus remains a topic for debate rather than one that can be resolved with data. Professional football is an extremely high injury risk profession. It has been estimated that its overall risk of injury is about 1,000 times higher than for typical industrial occupations generally regarded as high-risk. While in the last 30 years the training and match volume has notably increased due to the enhancement in professionalism of football, the risk of injury has not increased. This is possibly due to the improvement of athlete healthcare and to the implementation of programmes of prevention. According to the UCL injury study, a professional football team can expect about 50 injuries that cause time-loss from play each season, which equates to two injuries per player per season3. The impact of injuries on team performance can therefore be considerable as on average, 12% of the squad is unavailable due to injury at any point during the season. In modern football, where a considerable amount of money is invested, this has a notable economic impact with some teams reportedly losing millions of Euros due to injury. These data suggest the importance of the medical staff, whose role in many clubs and federations is still undervalued. Most injuries occur during a match where there is a five times higher risk of injury compared with training. Data from The UEFA Champions League show that the risk of injury remained constant in the last decade (Figure 1). During a match, data show that injury incidence increases during the last part of each half (Figure 2). There is also evidence that overuse injuries have a higher incidence during the preseason (Figure 3), while there are different trends of seasonality linked to different regions and their specific environmental conditions. The most common injury in football is thigh strain, typically affecting the hamstring muscle group. Thigh strain represents about 17% of all injuries and a typical 25-player squad can expect 10 thigh strains each season, with seven hamstring and three quadriceps strains5. Figure 4 shows the percentage of injury in relation to the most common locations. In general, muscle injuries represent almost one third of all time-loss injuries in men’s professional football and 92% of all injuries affect the four big muscle groups in the lower limbs. Again, if we consider a team of 25 players at elite level, we can expect about 15 muscle injuries each season, with approximately 2 weeks missed for each injury. Muscle injuries tend to occur more frequently toward the end of each half (Figure 5). The knee is the second most common location of injury in football players (Figure 4). Despite their relatively low incidence (<1% of all injuries), anterior cruciate ligament (ACL) lesions are the most attention-drawing pathology in football medicine. While some decades ago it was a career-ending injury for a footballer, progress in athlete healthcare has led to a return to football outcome at the same level as before the injury in 90% of patients. However, there is an increased risk of suffering a new knee injury (especially overuse injury) on return to elite football after an ACL injury. In football, ACL lesions are generally treated surgically. The lay-off after an ACL injury is between 6 to 7 months, even after optimal caretaking. However, as pointed out by Ekstrand6, the fact that it is possible for almost all players to return to football after ACL surgery does not necessarily mean that return to play is always ideal from a medical point of view. It could also be a sign of knee abuse. HIP AND GROIN INJURIES: TIP OF THE ICEBERG? The hip and groin are another common injury location. It seems that the real magnitude of injuries in this location has been underestimated so far due to the relatively difficult diagnosis and injury definitions which do not always allow a clear identification and classification of such injuries. According to Werner et al7, a team will have seven groin injuries each year. In addition to this considerable incidence, which has been shown to be consistent over consecutive seasons, groin and hip injuries have a significant severity: more than half of them imply a lay-off time of more than 4 weeks. However, this could also be only the tip of the iceberg. FOOTBALLER’S ANKLE: SHOULD WE WORRY ABOUT IT? The ankle is the most common injury location in all sports combined. In football, around 90% of ankle injuries are sprains. The first football epidemiological studies were performed in the early 1980s and reported that the ankle is the most common location of injury (around 30% of total injuries). More recent reports show a decrease of about 50% of ankle injuries. This can be the result of prevention strategies (e.g. neuromuscular training, bracing, taping) which have proved to be effective in reducing the incidence of ankle sprain or this may be due to changes of the rules of the game such as a red card for a tackle from behind. Another possible explanation can be the change of football performance which requires more intensity, implying an increased risk of overuse injuries. Finally, this may be also due to a different injury definition. However, ankle injuries seem to be relatively important in modern football, both in term of incidence and of time loss, being preceded by thigh, knee and groin as the most common locations of injury. Women’s football has gained more and more importance in the last few years. The number of participants is rapidly increasing together with the discipline’s professionalism. Male players have an increased risk of training and match injury compared with female players, but the risk of sustaining a moderate to severe injury (>1 week absence) does not differ between men and women. Injury patterns are largely similar but females suffer relatively more knee injuries and men suffer more groin injuries. Female players have a two to three times higher risk of ACL injury compared with their male counterparts. Females also tend to sustain their ACL injury at a younger age and have a higher risk of injury, especially during match play, whereas no relevant gender-related difference seems to exist during training. These data have provided the basis for an extensive programme of prevention for ACL injury in female footballers. Re-injury rate is sometimes considered as an instrument to measure the skills of medical staff. In fact, if injury incidence is mainly affected by technical and performance activities then re-injuries, as determined by an early return to play and incomplete rehabilitation, are often associated with medical staff performance. In more recent football studies, a re-injury rate between 12 and 30% has been reported. Also, re-injuries are associated with higher severity compared with first injuries. This relatively high incidence and severity underlines the importance of correct guidelines in the return to play decision. These results seem to suggest the need for new football-specific medical and physical tests to assess athletes before they return to play. Objective data could help the clinician avoid an attitude that is too aggressive (which could increase the risk of re-injury) or too conservative (which would have a negative impact on the layoff time of the athletes). The risk of football injury seems to increase with increased age, career duration and previous injury. Mechanical instability in ankles or knees, joint laxity or functional instability also seem to predispose players to injuries, in particular of the hamstrings, groin and knee. Players with positive history have been shown to be two to three times more likely to suffer an identical injury in the subsequent season. The analysis of intrinsic risk factor may allow clinicians to prepare individual programmes of prevention at the beginning of the season. The influence of extrinsic risk factors needs to be analysed as well. Physical and psychosocial stress appears to increase the injury risk. However, the role of testing the level of stress of the footballers is still generally underestimated. It seems that there is not an increased risk of injury associated with playing on last generation artificial turfs. However, ankle sprain incidence is increased while quadriceps strains decreased on this surface. This may suggest the use of specific preventive measures for teams playing or training regularly on this surface. Weather and pitch conditions seem to affect injuries, creating regional differences in match injury incidence. Teams from northern Europe (e.g. England and the Netherlands) have a higher risk of injury than teams from southern Europe (e.g. France, Italy and Spain), possibly due to poorer climate and surface conditions. Conversely, there is a trend toward an increased risk of ACL injury in Mediterranean countries, where it has been hypothesised that the pitches may be a risk factor. These data underline the importance of developing regional epidemiological studies in order to define and characterise the particular injuries for each country. With the 2012 Olympic Games and the 2014 FIFA World Cup both being organised during the period of Ramadan (Islamic holy month of fasting), there is a debate about the possible effects of fasting on physical performance and injury. A study of injury epidemiology in Qatari footballers has allowed the investigation of the influence of Ramadan on football injury incidence and patterns. In a population with a majority of Muslim footballers competing in a Muslim country, no significant difference of injury incidence, characteristics and patterns has been shown during Ramadan compared to the rest of the football season. On the contrary, there is some evidence that non-Muslim footballers competing in a Muslim country suffer more during this time as they struggle to cope with the changes is social and sport life during this period such as training time modifications. There have been numerous epidemiological studies related to soccer undertaken in numerous countries and employing various methods of data collection. The differences in definition make it difficult to interpret the findings in a comparable manner. In the last few years, experts have provided guidelines on injury definitions and collecting procedures8. This has allowed comparisons of the results from more recent research, permitting a better definition of typical patterns of different settings. Another important factor for each epidemiological research project is the reliability of data. The involvement of different clinicians in the data collection can be a source of bias. Constant supervision of the people in charge of the data collection is fundamental in order to ensure complete and reliable collection. New technologies such as mobile phones, tablets and specific software have been implemented with this aim. In addition, recent literature shows the need for a revision of the best definition of injury to be utilised in order to capture the kinds of injuries and complaints. 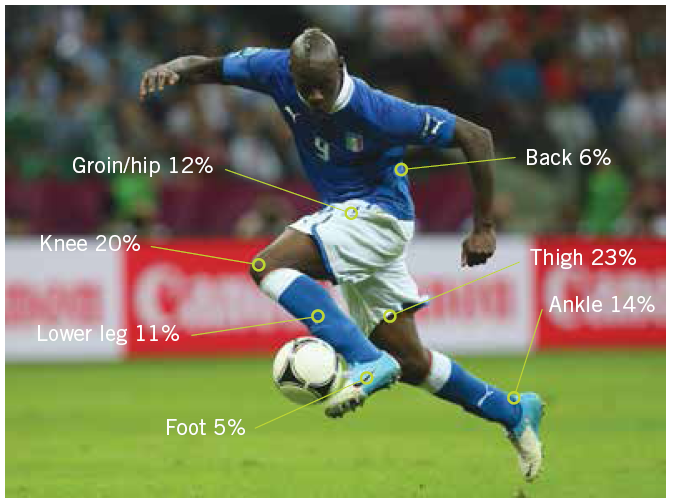 Reliable injury data collection is an important tool for football medicine clinicians. The implementation of effective strategies of prevention should be based on reliable epidemiological data which allow tailored interventions. This has to be added to the personal clinical experience, which remains one of the main decision-making factors for each physician. A famous quotation by Einstein says: “Not everything that counts, can be counted; not everything that can be counted counts”. We think that this applies to football injury epidemiology as well. Eirale C, Tol JL, Farooq A, Smiley F, Chalabi H. Low injury rate strongly correlates with team success in Qatari professional football. Br J Sports Med 2012 [Epub ahead of print]. Waldén M, Hägglund M, Ekstrand J. UEFA Champions League study: a prospective study of injuries in professional football during the 2001-2002 season. Br J Sports Med 2005; 39:542-546. Eirale C, Farooq A, Smiley FA, Tol JL, Chalabi H. Epidemiology of football injuries in Asia: a prospective study in Qatar. J Sci Med Sport 2012 [Epub ahead of print]. Ekstrand J, Hägglund M, Waldén M. Epidemiology of muscle injuries in professional football (soccer). Am J Sports Med. 2011; 39:1226-32. Ekstrand J. A 94% return to elite level football after ACL surgery: a proof of possibilities with optimal caretaking or a sign of knee abuse? Knee Surg Sports TraumatolArthrosc 2011; 19:1-2. Werner J, Hägglund M, Waldén M, Ekstrand J. UEFA injury study: a prospective study of hip and groin injuries in professional football over seven consecutive seasons. Br J Sports Med 2009; 43:1036-1040. Fuller CW, Ekstrand J, Junge A, Andersen TE, Bahr R, Dvorak J et al. Consensus statement on injury definitions and data collection procedures in studies of football (soccer) injuries. Scand J Med Sci Sports 2006; 16:83-92.